April 18th, 2017 | Children & Pets, Moving Tips. Your outdoor cat may be adventurous and resilient, but after you move to a new home, your furry friend may need help adjusting. Immediately after your move, your cat is at a higher risk of getting lost or injured due to the unfamiliarity of the yard and neighborhood. 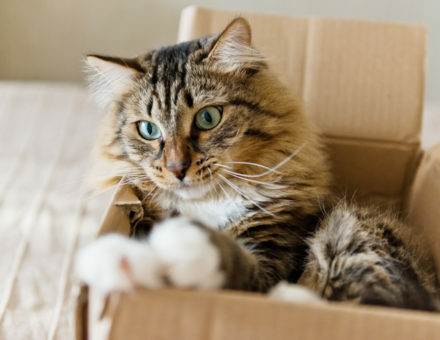 Luckily, you can help protect your cat from potential hazards by taking the following six steps after you arrive at your new home. Many outdoor cats, like to wander around the area they consider to be their territory (usually your neighborhood). These animals use familiar sights, sounds, and smells to find their way home if they stray too far. In a new area, however, your cat may become confused or lost. The best way to protect your pet in this case is to update its licensing. Get tags with your address and an accurate phone number on them. Also consider investing in a microchip if your animal does not already have one. Moves can be rough on you and your cat’s health. Just like it’s important for you to find a new medical provider after a move, it’s important to establish care at a vet’s office. Establishing care at a vet’s office ensures that there are no gaps in your pet’s medical treatments and that you can be seen sooner in an emergency. Additionally, a local vet can provide you with recommendations based on differences in climate or plant life between your last house and your current home. You may need to take medical steps to help your cat adjust, especially if the weather in your new area is significantly different than your old home. Just because your new yard looks nice doesn’t mean it’s safe for your cat to run around in yet. Assess the condition of your fence if you have one and have any weak points repaired. Resolve any issues you find before letting your cat roam free. In addition to your yard, your cat will also interact with the rest of the neighborhood. Before letting your cat out of the yard, walk the neighborhood. Look for anything you should avoid, such as aggressive local animals, large roads, or active construction sites. If you see other cat owners out and about, introduce yourself. Talking with your neighbors can help you get a feel for how well your animal will do in the neighborhood. If you moved from a rural area, your outdoor cat may have happily roamed free wherever it chose. However, many cities have restrictions intended to reduce the amount of strays in the area. You may be required to provide your cat with a certain type of licensing and that you keep your furry friend’s vaccinations updated. Even if your cat is rarely found indoors, you should keep it inside for at least three weeks after your move. This time period allows your cat to become comfortable with the layout and atmosphere of your new home. If your cat needs to be brought in at a future date, feeling comfortable inside can help your animal stay calmer and better behaved. If the weather permits, leave your windows open during the day so your cat has a chance to smell the air, watch the wildlife, and become somewhat familiar with your yard. The first time you let your cat outside without a leash, provide some supervision and keep your home accessible. Your animal will likely feel safer in its new yard if it has the familiarity of home to retreat to if necessary. Use these tips to help your pet feel as happy in the area around your new home as you do inside it. For more information about moving with a pet, consult with the experienced movers at Wheaton World Wide Moving.